FULL TIMEThe final siren sounds with Carlton grinding out a solid 32 point win. St Kilda challenged but Carlton had all the answers tonight and head into the break on a winning note. BEHIND SAINTSSt Kilda look to finish the night off with one last goal, but it's punched through for a rushed behind. BEHIND SAINTSSiposs marks in the pocket but his shot at goal misses to the left. GOAL SAINTSHayes with another assist as he hits Billings on the chest. 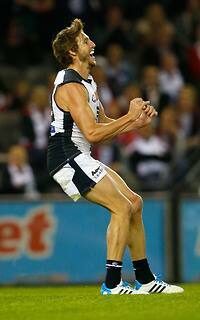 Billings, playing with the maturity of a five year player regains his composure and kicks the goal. GOAL SAINTSRiewoldt marks on his chest and kicks a well deserved fourth goal. Carlton's midfield are racking them up like a world class snooker player! Gibbs has 38 touches, Simpson has 36 and Murphy has 32. GOAL BLUESIt's party time for the Blues and Garlett is pulling out his party tricks! Robinson handballs to him on the boundary and he banana kicks a ripper! Watch the replay! GOAL BLUESJack Steven hands it to Docherty who can't believe his luck. He takes a couple of steps and kicks the goal. Carlton lead by 40 points with over four minutes to play. GOAL BLUESMitch Robinson runs inside 50 and marks running with the flight of the ball. 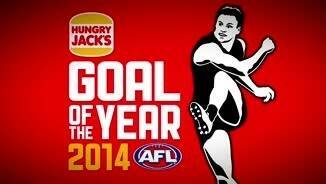 From 40 metres out he kicks the goal and that shuts the gate on the Saints. BEHIND SAINTSA rushed behind to the Saints as the Blues look to rebound. BEHIND BLUESMenzel takes another mark inside 50 and once again his shot misses to the left. Carlton have steadied and will see this match right out to the end. BEHIND BLUESArmfield runs to the pocket and centres to Menzel who marks, but he slices his shot at goal to the left. 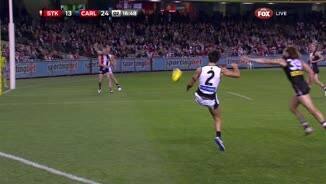 BEHIND SAINTSRiewoldt handballs it to Siposs who must kick this from 20 metres out and doesn't. GOAL BLUESCarlton seem to have St Kilda's measure with Yarran running onto it in the goal square to kick his fourth goal. Carlton lead by 28 points. Brock McLean has blood streaming down his eye. How could he possibly see with all that coming down? BEHIND BLUESCasboult has another opportunity and he sends it left. It comes back, but not far enough and it's through for a behind. BEHIND SAINTSDunstan creates an opportunity out of nothing and soccers off the ground, but he misses to the left. SUBSITUTION BLUESCarlton have activated their substitution with Garlett coming on for Ellard. GOAL SAINTSRiewoldt runs from one left to right to shake off Rowe and mark on the 50. HE goes back and kicks a wonderful goal. The captain leads from the front! The first goal of the quarter is up for grabs and if the Saints get it, we could have a game on our hands. Saints InterchangeLuke Dunstan off due to an injury. Welcome to Etihad Stadium for the St Kilda v Carlton Round 8 clash. BRYCE Gibbs has led Carlton to its third win of the season, a gritty 32-point win over St Kilda at Etihad Stadium on Monday night. The midfielder, who has been the subject of much speculation over his future with the club, was central to the Blues' 15.11 (101) to 9.15 (69) win. The 25-year-old gathered 38 disposals – the second most prolific outing of his 163-game career – to sink the Saints, whose midfield brigade was outclassed and outworked by Carlton's line-up. 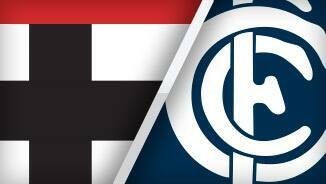 Carlton may have a concern, however, with Marc Murphy likely to come under scrutiny by the Match Review Panel for a clash with opposing Saints skipper Nick Riewoldt in the third quarter. While Murphy appeared to attempt to avoid bumping Riewoldt, the champion Saint was collected and left the field for almost 10 minutes while being tested for concussion before returning. The Blues did most of their damage in a blistering second term, piling on eight straight goals and opening up a 39-point lead at the main break. "We went out there to defend the ball and the best form of defence is to have the ball and from that we were able to score. 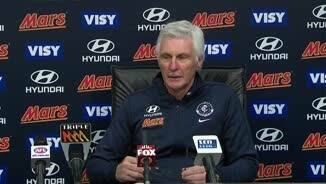 There was no freewheeling, let's blister the scoreboard, let me tell you that right now," Blues coach Mick Malthouse said following the win. "That consistency we just haven't really been able to mount that practically all year. It's something we as coaches look at just to (try to) find a common denominator." After a sloppy and scrappy first term, which wouldn't have impressed the lowly crowd of 26,708, the Blues were kickstarted by youngster Troy Menzel, who booted three goals for the term. First was a checkside from the pocket, then a snap after a sidestep and then a 50m bomb from a set shot, displaying just a pinch of the 19-year-old's immeasurable talents. Chris Yarran was another to shine, kicking two of his three goals in the term, one of which one came after a four-bounce run through the centre corridor. Gibbs was clearly best afield. His possessions had value, he set up opportunities, and seemed to have time and space for most of the game. Kade Simpson (36 touches), Brock McLean (29) and Marc Murphy (32) were solid, and Dylan Buckley continued his breakout season with tenacity and run from defence. Where the Blues had a bevy of goalkicking options in the game-breaking second quarter, the Saints looked almost solely to captain Nick Riewoldt. No.3 draft pick Jack Billings chipped in with a classy conversion but there was little else in support for Riewoldt. All of a sudden, the Saints had options. Adam Schneider kicked a goal, and Luke Dunstan ripped the ball out and snapped one of his own. 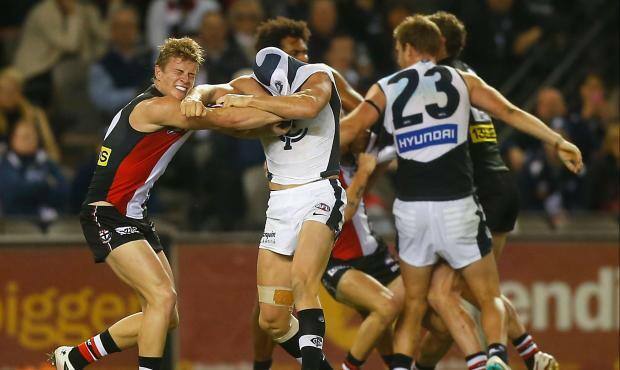 With Riewoldt off the ground for almost 10 minutes while recovering from his knock, St Kilda's movement became more unpredictable, and others became more involved. The Saints cut the margin to 27 points by the last change, but could have been more, having booted 2.7. They left themselves with too much to do. "[It was] nine scoring shots to two, and potentially could have made a game of it. 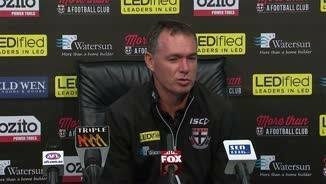 There was some belief among the group, you could sense that at three-quarter time," Saints coach Alan Richardson said post-game. "There's no doubt that if you're not going all that well, and you're up against some real quality … we just couldn't quite match it there. If we had of made the most of those opportunities, who knows?" Riewoldt finished with four goals – taking his season tally to 22 – and tried hard all night, fellow veterans Lenny Hayes (30 disposals) and Adam Schneider (26) provided some experience, and Billings continued to show why he was such an early draft choice with 15 touches and two goals.